This current to measurement conversion tool will convert an electrical signal within the range of 4 to 20 milliamps to the ideal reading of any linear measurement type and create an incremental milliamp conversion scale for each measurement range entered. Add the current loop signal reading in milliamps (mA) between 4 and 20 mA that you want to convert. Enter the measurement unit associated with the output values. Add the minimum possible value for the measurement range of your instrument. For example zero would be a typical value for most instrumentation but you can also add negative (-) or positive (+) values as well. A value in any engineering units can be used as long as it relates to a linear measurement, and the same unit is used for the Highest value. Add the maximum possible value for the measurement range of your instrument, e.g. full scale or full range. This value can be negative (-) or positive (+). Any engineering units can be used as long as it relates to a linear measurement, but the same unit must be used for the Lowest value. This is the ideal converted measurement for your instrument and therefore represents a perfect reading excluding the measurement uncertainty error of your instrument. The answer value is displayed in the same engineering unit that you entered for the Lowest and Highest range points. How precise is the converted measurement? The linear measurement Answer is displayed to a precision of 9 significant figures. How do I convert an inverted or reversed 4-20mA signal? Can I use this converter to calibrate a 4-20mA measurement device? You can partly use this converter to aid calibration. When you calibrate you will need to precisely measure both the input and output parameter. You can use this converter to determine the ideal measurement reading and compare it with the calibration measurement to determine the calibration error. Do I enter the input or the output value for the 4-20mA signal? This converter is not input or output specific, so you can convert either ‘input to output’ or ‘output to input’. 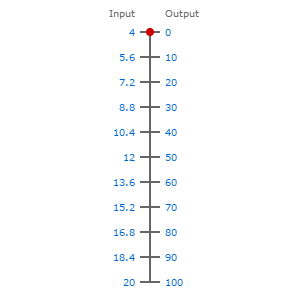 This means that if you were to plot input and output readings on a graph they would produce a straight line. What formula is used to convert 4-20ma into % of reading? 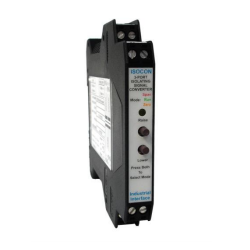 Send us your enquiry for a product associated with this 4-20mA milliamp Current Range Input Scaling Converter page, and get assistance with selecting a product for your application.